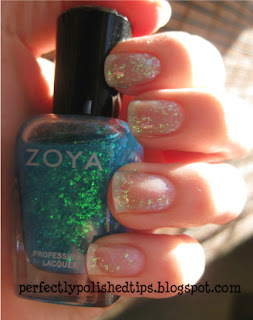 Perfectly Polished Tips: Perfectly Polished Tips 200 - Zoya Fleck Effect & a 200th Post Giveaway! Perfectly Polished Tips 200 - Zoya Fleck Effect & a 200th Post Giveaway! In addition to their True collection, Zoya released Fleck Effects. Three holographic, flake-y top coats. They can be worn alone or over any polish of your choosing. In my Zoya True post I showed them over Bevin, Cho, and Farah. To be honest I am not big on any type of glitter, shimmer, or flakes on my finger tips. I prefer cremes, not too sure why. I will go wild on my toes but usually I like to keep it simple. I hate showing my naked nails! When I did last month's glitter challenge I really did a number on my nails. I don't know what it is about glitter polish but I always feel the need to pick it off. That in combination with not moisturizing left me with some gnarly tips. I did my best to clean them up so hopefully my photos aren't too offensive! I found the fleck top coats to be a little on the thick side. For my photos I show each polish with 1 coat (pinkie nail), 2 coats (ring nail), 3 coats (middle nail), and 4 coats (index nail). I would probably go with three coats if I was to wear it alone and I found one coat to be perfect over Bevin, Cho, and Farah. That is just me though, feel free to go wild :) Layering over black polish is also another option. Maisie is a sheer turquoise base with flakes that shift from blue to green. This is my favorite of the three and would look awesome over blues, greens, and teals. Opal is a sheer green base with flakes that shift from green to blue. I could see this looking amazing over a pea green or maybe even a neon green. The Fleck Effect holographic nail glazes are available now at Zoya.com. They retail for $8 each or you can purchase all three for $24. I have finally made it to my 200th post! It feels like it took an eternity to get here. I don't really remember why I decided to number all of my posts, seems silly now when I think about it. 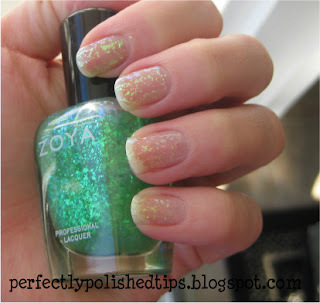 Anyway, to celebrate reaching 200 I am giving away one set of Zoya's Fleck Effect nail glazes! 1. Like Perfectly Polished Tips on facebook. 2. Share my contest in some way, facebook, blog about it, tweet it. 3. Leave a comment letting me know which one(s) you did. Don't facebook, blog, or tweet? Leave me a comment telling me about your favorite layering combination. Contest will end on Feb 2, 2012 at 11:59PM EST. Good Luck! shared through facebook, twitter and emailed a bunch of my friends/family! :) LOVEEE your blog btw! Shared your giveaway in Twitter and liked you on Facebook! shared via facebook!! thanks for the giveaway! i shared this contest w/ my friends and liked your page. thanks so much for hosting this giveaway! liked and shared on facebook, my name is brooke bishop if you need to know that! shared on facebook! and liked you on fb! I shared on FB and twitter and liked on FB. I like the Fleck Effects over white! Liked and shared on facebook, tweeted, and blogged. Thank you so much for the giveaway! Shared on Facebook and liked your page. Love the flakes! So into bling nails and getting more addicted with every page I find! I shared it on facebook.....thanks for the giveaway!! Hi! I liked your page on facebook and shared your giveaway via twitter!! Thank you for the giveaway! I shared on Facebook :) Thanks for the chance to win! I shared on my SetInLacquer Facebook Page. Liked on fb, Shared on twitter! I liked your facebook and I shared your giveway on on my facebook page! Liked your facebook and shared giveaway on my wall on my page. My favorite layering combo is Opal over Tru.. pure perfection right there! Liked on facebook & tweeted. Shared your giveaway post on Facebook! hey Dami! I tweeted about your blog and great nails :) Sweet giveaway! Shared your giveaway on Facebook. Thanks for an awesome blog!! i liked your FB page..thanks for sharing your info on the latest nail trends! Hi, thank you so much for this great giveaway. I liked Perfectly Polished Tips page on Facebook. I shared this giveaway with friends on Facebook. I am commenting to let you know I did all three. Also, thank you again for giving everyone here an opportunity to enter.